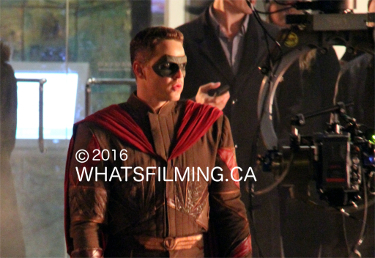 Last night Sidekick, an indie short film with Josh Dallas from Once Upon a Time filmed scenes in downtown Vancouver near Oceanic Plaza. 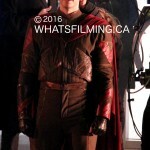 Check out some pictures below. 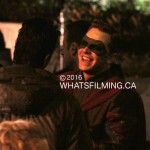 Sidekick has finally been released! 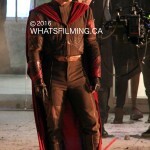 Watch the video on YouTube right here and check out the behind the scenes pictures of Josh Dallas below. 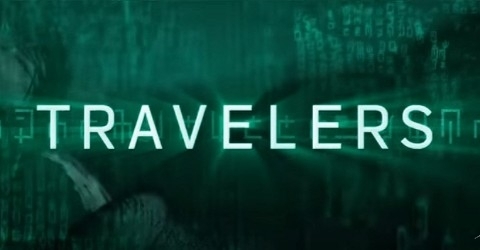 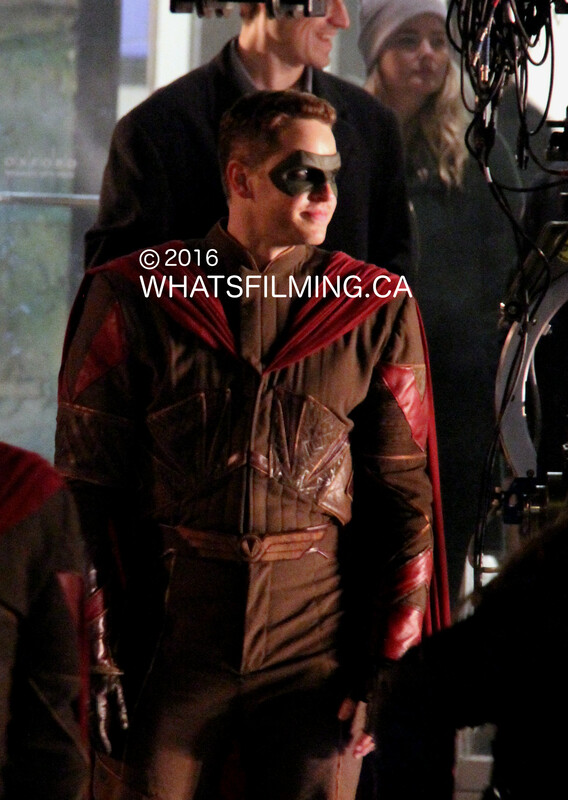 The short film also stars Emily Bett Rickards (Arrow), Tom Cavanagh (The Flash), Sage Brocklebank (Psych) and Christian Michael Cooper (Prison Break Reboot). 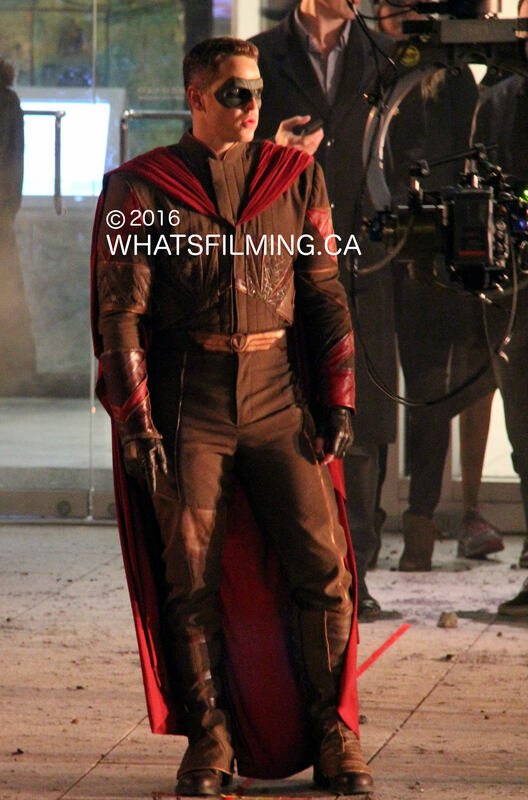 As if being Prince Charming isn’t enough, Josh Dallas (Once Upon a Time) is now a superhero too. 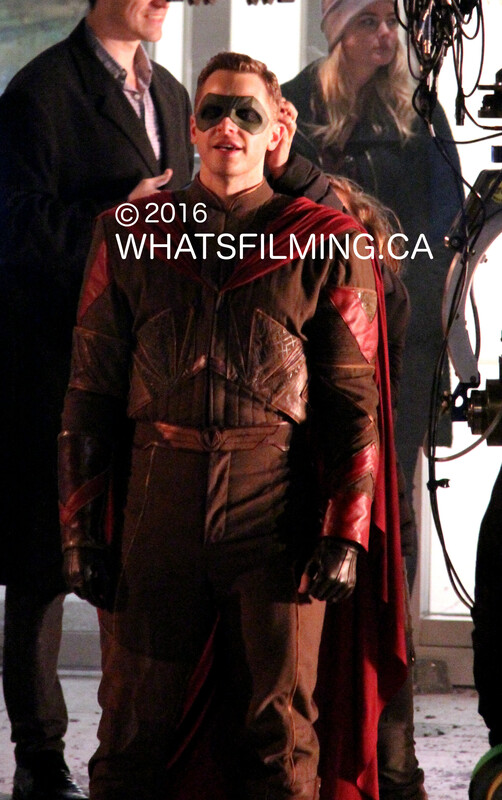 While many actors took a break from filming and returned home for Good Friday and the Easter long weekend, Josh continued work on his latest (side) project: Sidekick. 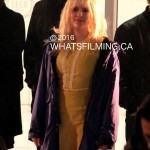 Production officially started last weekend. 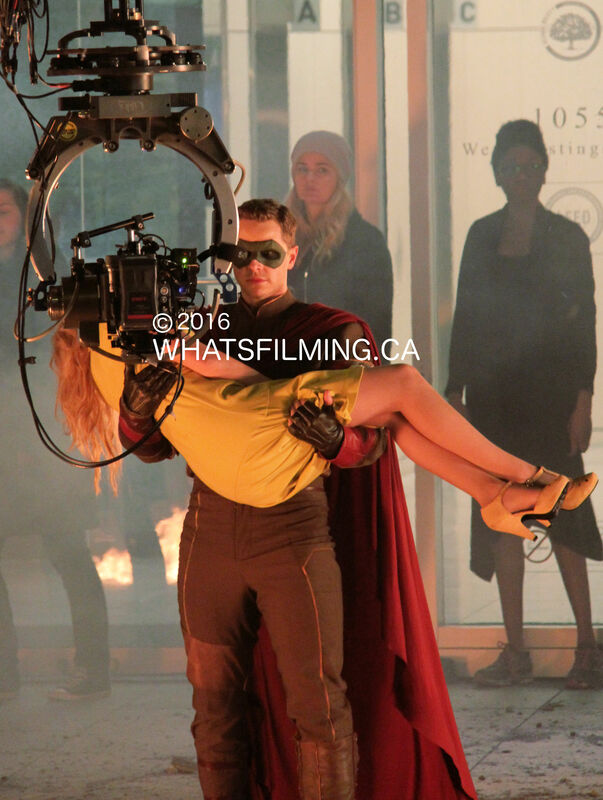 Special thanks to @katmtan for letting us know it was Josh playing the role of the superhero! 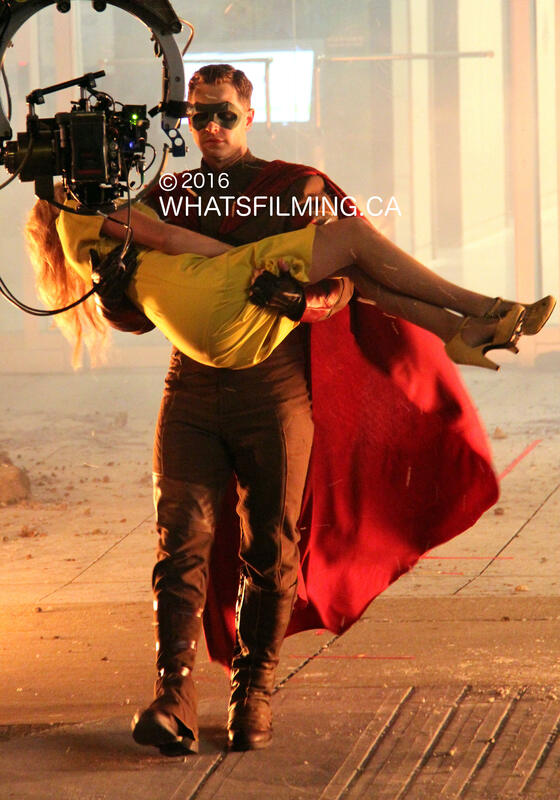 Sidekick is a indie short film directed by Jeff Cassidy about a superhero (played by Josh Dallas), a villain and a damsel in distress. 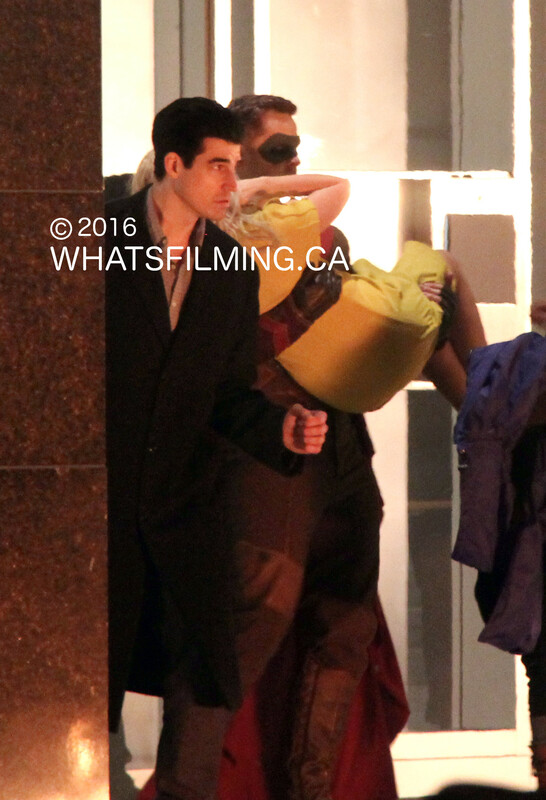 Vancouver local Emily Bett Rickards, who plays Felicity on Arrow is rumoured to be among the cast for the project. 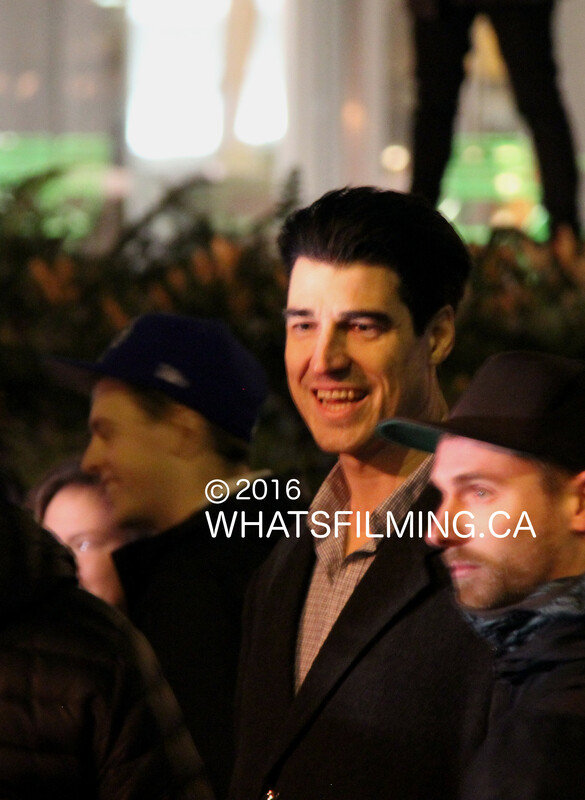 Lee Shorten who plays Sergeant Yoshida on Amazon’s The Man in the High Castle will also appear. 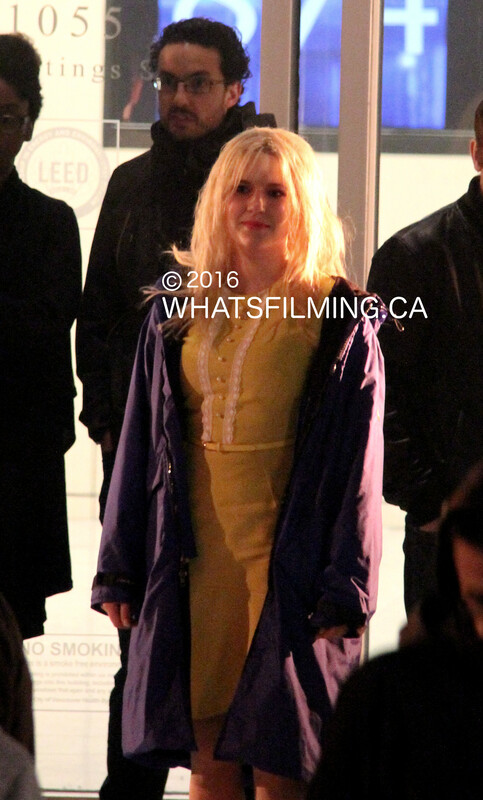 There were a few scenes being filmed last night along West Hastings Street near Vancouver’s Oceanic Plaza. 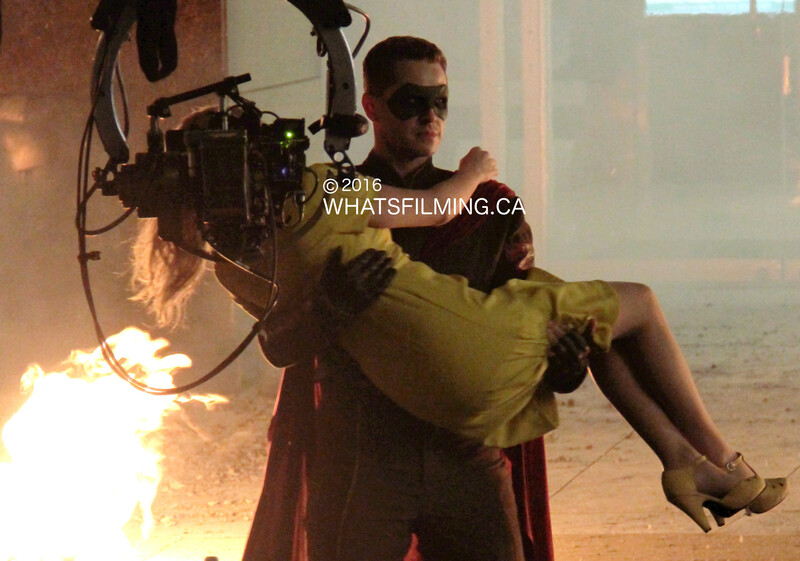 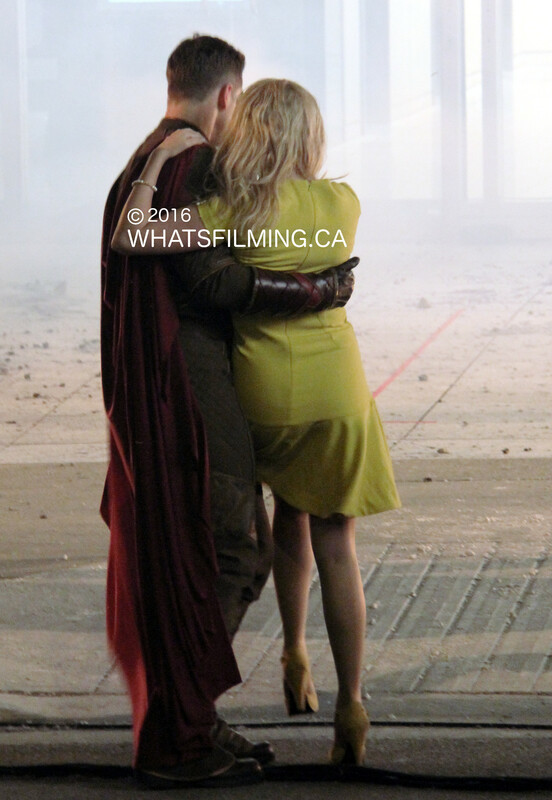 Among them was a scene where Josh Dallas carried the damsel in distress out of harm’s way. 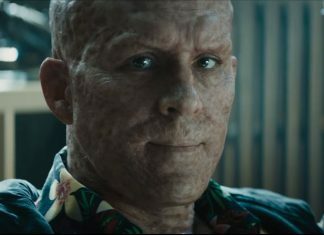 The surrounding area was setup to look like the aftermath of mass destruction with debris, broken pieces of pavement and fire everywhere. 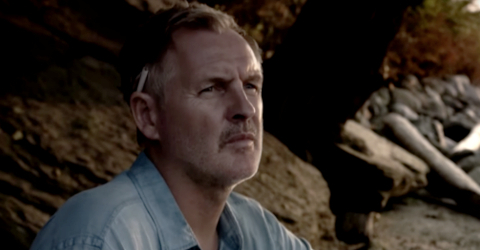 For a scene later in the night, several destroyed cars were placed along the street. 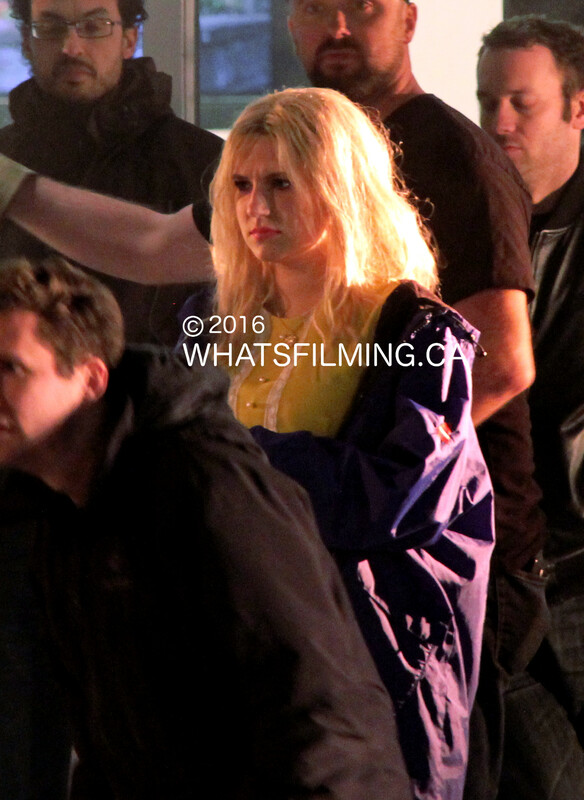 If you happen to recognize the the other actors in these photos, please comment below or Contact Us to let us know so we can properly credit them. 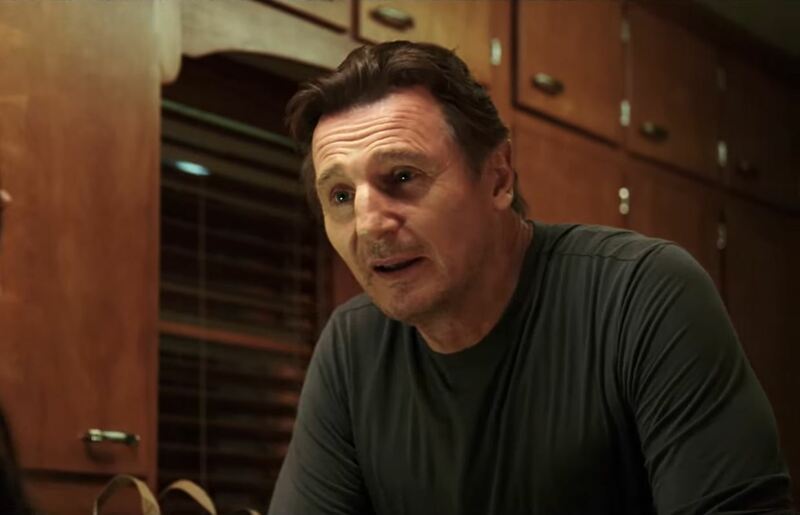 As a fun fact, the film’s director Jeff Cassidy is no stranger to the superhero genre. 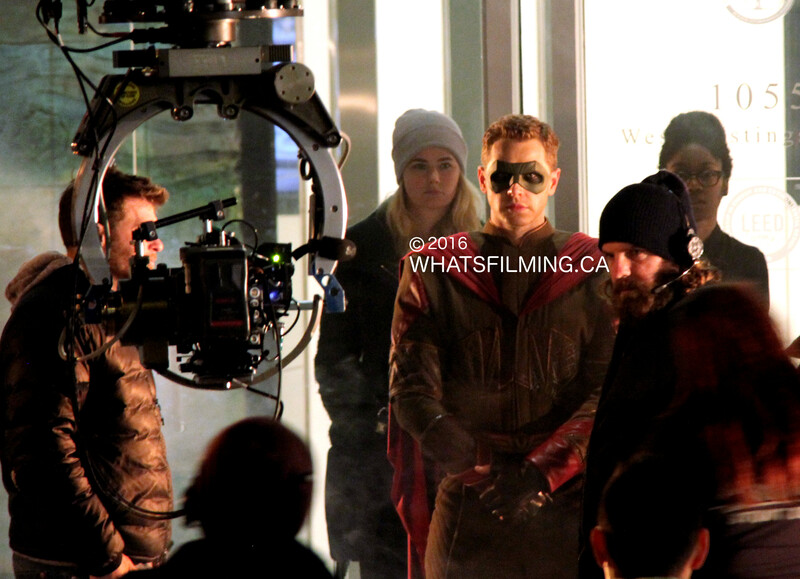 He has worked on several episodes of The Flash as a First Assistant Camera. 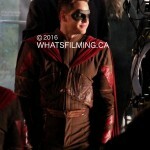 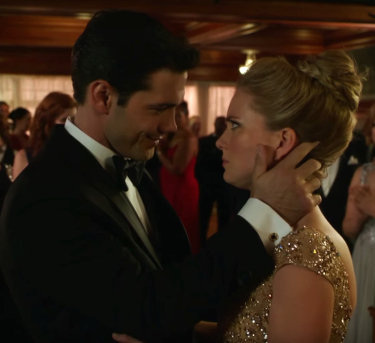 Betty Dubney, a costume designer who also works on The Flash, is part of the Sidekick project. 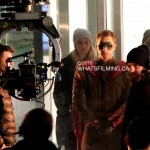 This would explain why the superhero costume looks awesome! 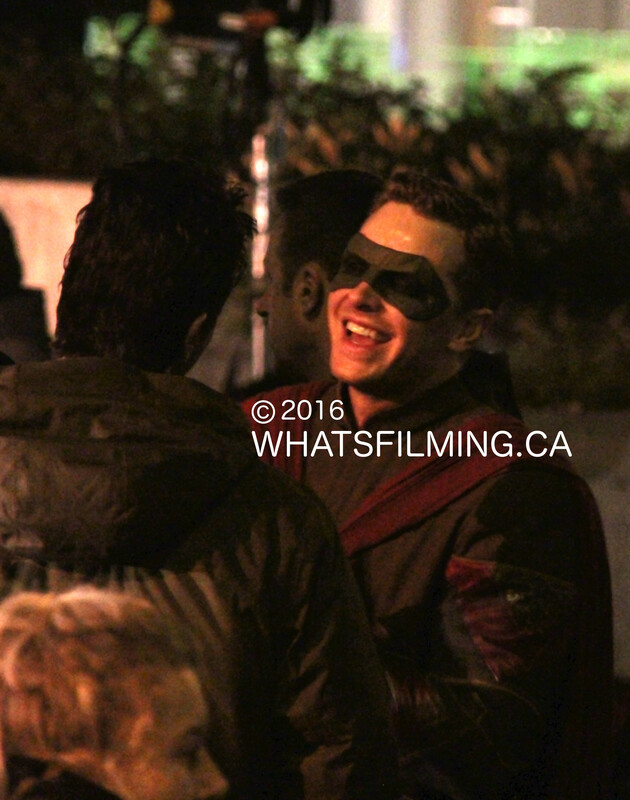 If you see Sidekick filming around Vancouver be sure to let us know by sending us a tweet (@WhatsFilming) or via our Submit a Location page.